Fundraising to provide quality education through virtual classrooms to children in urban slums. Every support counts! School education in India is still a distant dream for many. For kids going to nearby schools, the non-availability of good and sufficient number of teachers is a major setback. The situation becomes all the more complex in semi-urban and rural areas. 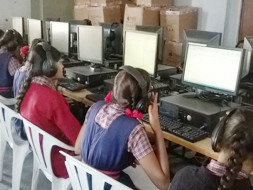 Based on our rich experiences with serving the rural and urban poor children, we have created a holistic program called “Megha Dootha” (the Cloud Messenger”) to address the larger concerns of lack of good education (or in many places, any education at all), we have come up with the concept of “Virtual Schools” through the use of online tutoring. This project aims at connecting these two sections viz. eager to learn students and good teachers who have a passion to teach. Our idea is to create “Virtual Schools” to teach deprived students through the internet and give them a chance to compete with their peers from cities. We want to create a level playing field for the rural poor and the urban slum children by this strategy of “Educational Inclusion” which is one of the pre-requisites for the goal of Financial Inclusion. Through Meghadoota, we want to create virtual learning centres, especially in semi urban areas and urban slums, using open software conference technology and provide the children in those areas an opportunity to learn from good and experienced teachers. What is the impact of this program? Children in rural& semi urban areas have limited or no access to facilities for acquiring English reading and speaking skills. Due to lack of skills in English language, these deprived rural students are often prevented from achieving their full potential and hence finding good employment. To remedy this grave deficiency ILID created and has been running a project named Pygmalion for the past 8+ years. It was conceived with the objective of enhancing the English skills of Rural& Semi Urban School Children. Pygmalion has been running successfully in over 500 schools across six districts of Karnataka (Bangalore, Mysore, Chamarajanagar, Shimoga, Chikmagalur, Hassan). The students as well as the teachers have shown great enthusiasm in learning/ teaching their subjects through this innovative and effective methodology. Now the focus is to take Meghadoota a step further with additional subjects and reaching out to other of rural centres. Did you know that there was a dropout rate at 37.82 for boys and 31.78 for girls in Hyderabad in 2013-2014 (Source U-DISEData 2013-2014) and there is a rate of 43.6 dropout of girls in the 10th standard in Karnataka in 2014. As many as 2.27 lakh fewer students went to school in the state in this academic year in Telengana. Our virtual centres aim at bridging this gap and improving the quality of education among students who take additional time to learn and need extra coaching. Students can gain momentum in studies apart from their regular schooling. The virtual centres will provide access to online tutoring in core subjects like Maths, Science and English as additional one to one help from expert teachers outside their regular classrooms. The aim is to reach the urban slums and remote villages across India through internet and offer top of the line learning methodologies to the POOR students EVERYWHERE through classes conducted by the best possible teachers / subject experts. Thereby we can bring together the eager to learn children and excellent teachers who can mould their lives. Also, many teachers request us to interact with and help children who are slow-learners. We realise that each child takes its own time to learn. Though all our programs to promote learning, we strongly believe that it should be done in a fun-filled, interactive manner. This online tutoring initiative also gives space for each child to pick up the subject in his/ her own pace. Has this been tested through a pilot project? Srilekha (Student): I liked the online tuitions because it is very useful for us. It is totally different way to learn by online. We can easily understand the concept. The online teacher is very good and makes every one understand the concept clearly. I liked her way of teaching. Manish kumar (student): It is very helpful for us. We are lucky to have online sessions. I learn many things by the online class like speaking in English without mistakes. Pragathi madam is good in teaching and she teaches Physics and Maths. I improved in both subjects. How will my funds be utilized? The funds would be utilised in the Operational expense and capital expense of setting up virtual centres with adequate infrastructure and facility to conduct our tutoring sessions successfully.